Prior to the launch of the new 2012 fluidic Hyundai i20, it was spotted plenty of times under high camouflage and there were also times when the same was seen with a pair of daytime running lights at the front. While we were expecting this exclusive feature on the new i20, Hyundai did not introduce the same on the car on its official launch day. Maybe it was planning to introduce it now. As one of the fellow blogs IndianCarsBikes is reporting, Hyundai has added the missing daytime running lights on the i20 in India. This exclusive feature is available on the top of the line Asta and Sportz variants only. This added feature does not come for free. 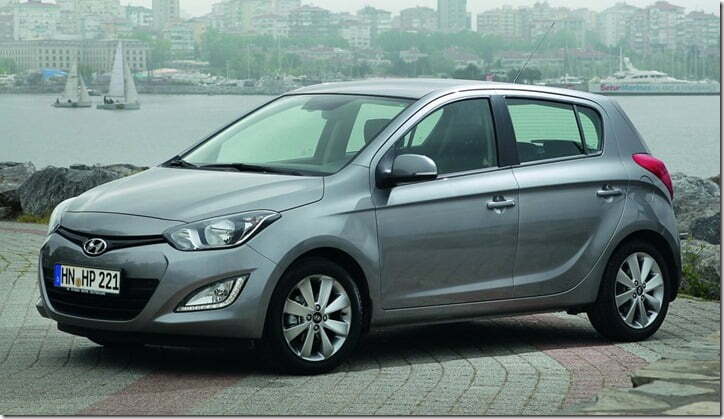 Hyundai has hiked the price of the Sportz and Asta variants by Rs. 9,750 all because of the added daytime running lights. This makes the i20 a bit more pricier than arch rivals such as 2011 Maruti Swift, Volkswagen Polo, but we should not forget that Hyundai offers some class leading features on the i20 which includes 6 airbags, rain sensing wipers, automatic headlamps etc. In fact with the aforementioned features, the i20 even beats some of the C segment sedans. Other features on the i20 include a start-stop button, keyless entry, a cooled glove box, electric sunroof, electrically adjustable outside rear view mirrors, and an automatic climate control system. The car is available with three engine options: two petrol engines and one turbocharged diesel engine. The petrol range consists of 1.2 litre and 1.4 litre units that put out a max power of 83 BHP and 99 BHP respectively. The same also produce 116 Nm 139 Nm of peak torque. Hyundai i20 already sells really well in the market and now remains to be seen to what extent the addition of the daytime running lights affect the sales of the top of the line Sportz and Asta variants.